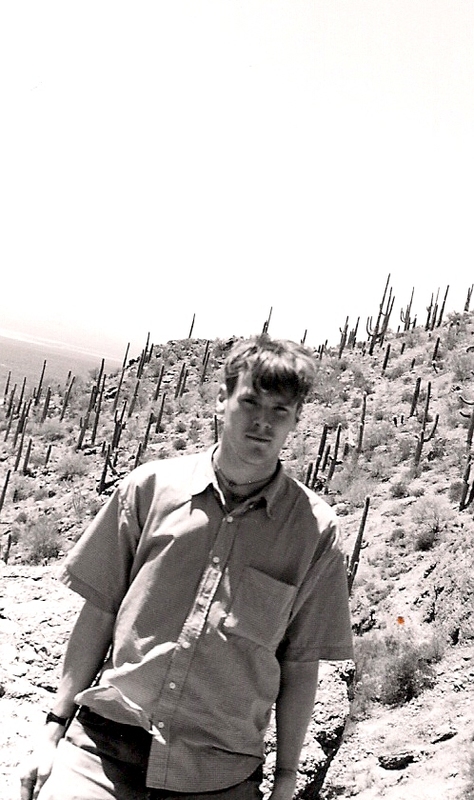 The author, faking it in Tucson, 1999. [G]o ahead and fake it hard. Any early and too bright confidence, even if unearned, might prove to be bankable, I want to think, against those innumerable midcareer instances of dread, the sense that your B.S. detector is still in one gleaming piece, but running an old, unsupported version of Windows. The machinery grows old and unreliable, or so it seems in post-midnight ceiling-staring sessions, the components no longer meeting plumb, their fits grown awkward, their lubricants dried and gone. Or potentially worse, the technology remains as reliable as a solid-state transistor, idiosyncratic but functioning, but the idea-fuel’s all spent.